This is just a short post to let any reader who happens by know that I am - after a long leave of absence - back. And that I will now be posting again reasonably regularly. Italian business confidence fell in May from a six-month high on concern that gains in the euro and slowing economic growth in the U.S. will hurt exports. 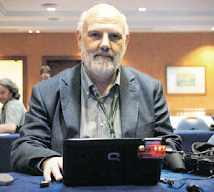 The Isae Institute's confidence index fell to 96.2 from a downwardly revised 97.9 in April, the state-funded research center said today in Rome. Italian retail sales fell for a third month in May as consumer spending continued to be hampered by rising gasoline prices and tax increases.The pace of the decline slowed in the month with a seasonally adjusted index of retail sales rising to 47.7 from 47.5 in April, according to a survey of 440 retail executives compiled for Bloomberg LP by NTC Economics Ltd. A reading below 50 signals a decrease. ``Today's figure is a snapshot of the situation of household spending in Italy; we're seeing modest levels of spending in line with what is perceived to be the level of disposable income,'' said Annamaria Grimaldi, an economist at Banca Intesa SpA in Milan. So this really does present us with the question: is Italy getting the German/Japanese elderly society disease of low internal consumption and strong export dependence for growth? If so the export sector really does need to be rejuvenated in order to try and push GDP growth rates about critical levels to maintain debt sustainability. 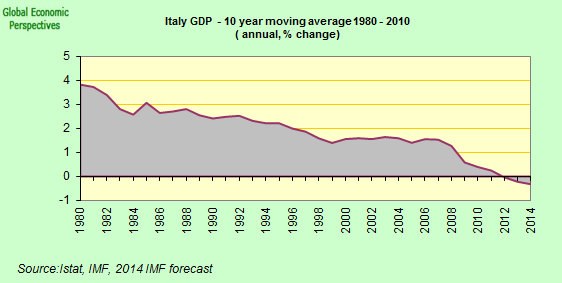 Last years 1.9% rise in GDP - good as it was in Italian terms - simply won't do. And growth this year looks decidedly more wobbly. More, and more in-depth, soon.